Pie Town is a tiny little community located about 20 miles west of Datil, New Mexico. The town was named after a baker in the 1920s that made pies. Pies so good, the town was named after it. So you can bet when I heard this town was holding its annual Pie Festival, I was going to attend. Always held the second Saturday in September, the event is a fundraiser held by the Pie Town Community Council, a volunteer organization that provides a variety of services for the town. 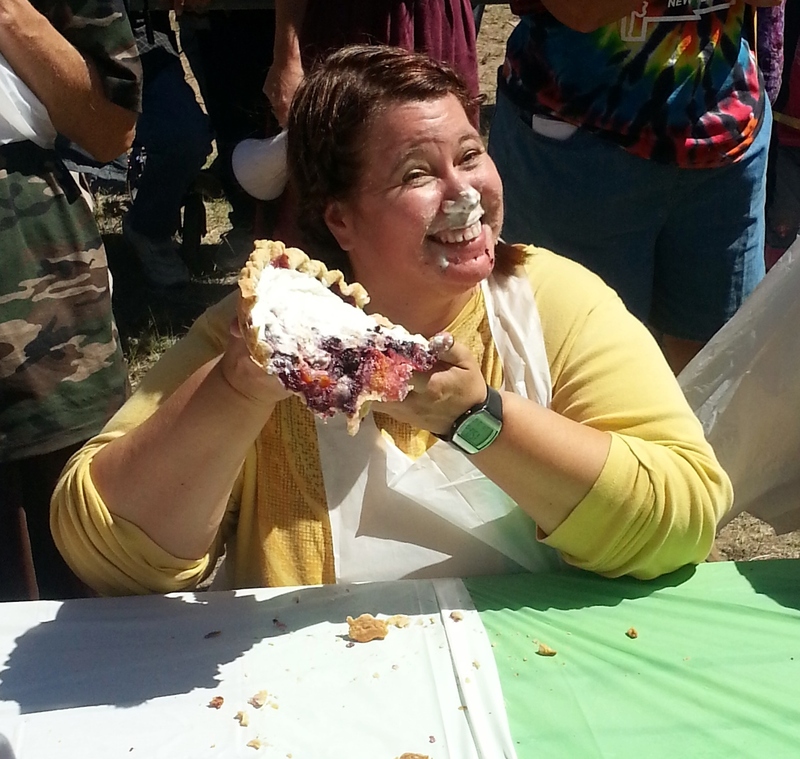 The event features crafts for sale, an open air flea market, pie eating and baking contests, horned toad races, the crowning of the Pie Queen, a dance, and most importantly… pie for sale. Early Saturday morning I, along with my seven-year-old nephew and a friend, made the trek to Pie Town. The plan was to ensure that we made it to the event in time to sign my nephew up for the pie eating contest, and to meet up with this blog’s very own zymbologistbob, who had been wanting to go to the festival for 14 some years, and a couple of his pie-friendly friends. The two-and-half-hour drive from Albuquerque to Pie Town was gorgeous. After a stop at the Very Large Array outside of Magdalena, New Mexico, we arrived. The festival is held in Jackson Park, along Highway 60 and across the street from the Pie-O-Neer bakery. There was plenty of parking available along the road, and the place was packed. Apparently, for such a small town, this festival is quite popular. Because, pie. Throughout the day, we met people from Oregon, Arizona, and California. 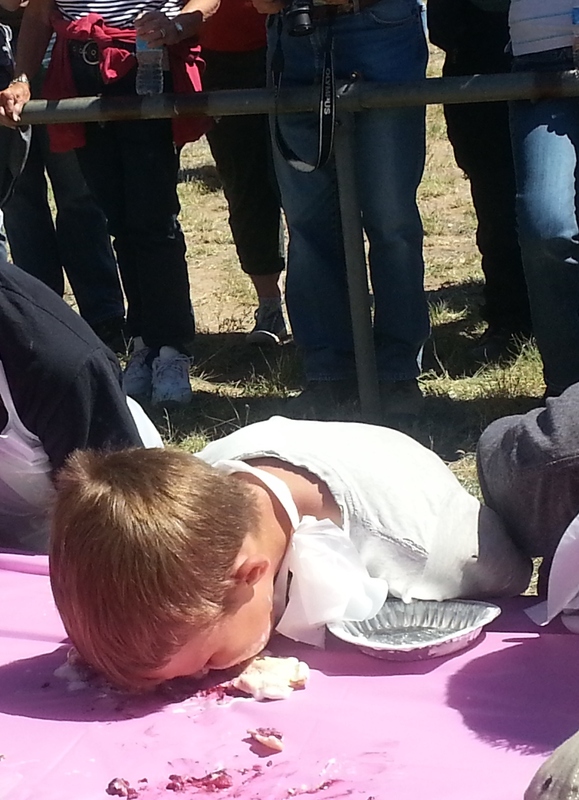 Our first stop was to sign my nephew up for the pie eating contest (and myself, but that’s another post). There were about 20 to 30 stands set up around the park with people selling different items. Some were crafters and others were selling tools and used DVDs and such. There were also several food vendors, selling burritos, Navajo fry bread and other treats. But there were only three pie stands among the town. I was a bit surprised, as I expected for a pie festival, there would be more pie stands. That said, the town is incredibly small, and perhaps for the citizens-to-pie ratio, three stands was more than enough. And truth be told, there was more than enough pie available from those vendors. After touring the stands, we made our way to the Pie-O-Neer bakery. After all, we were here for pie. The place was packed and the line was almost to the door. We each ordered something different (after some indecisiveness with my nephew who couldn’t decide if eating pie would make him too full for the pie eating contest). I had a slice of pecan pie, while my nephew enjoyed blueberry pie. My friend got a slice of the famous green chile apple pie. The pecan pie was lovely, it was light, and wasn’t too sugary. The crust was nice and buttery. My nephew said he greatly enjoyed his blueberry pie and was very impressed by the stars on the pie crust. But the green chile apple pie was by far my favorite (I took a bite of my friend’s). It had a hot bite to it, but it the chile flavor wasn’t overwhelming. In case you missed out on the festival this year you can always make your own green chile cheese apple pie with this recipe – previously posted here on EatingNewMexico. Topped off with pie after our long drive, we went back to the festival grounds. While my nephew played on the swing sets and slides, we waited for the crowning of the Pie Town Pie Queen. I was curious if there were campaigns run ahead of time for the crown, or it if was based off of the best baked pie. Unfortunately, those questions were never answered, as I missed the big crowning. All of the events were announced by a woman with a bullhorn, and by the time I realized it, the crowning was over. Zymbologistbob was upset he didn’t take the title, but I reassured him there is always next year. While we waited for the pie eating contest, zymbologistbob and his friends enjoyed pie from the Pie Town Café stand. Zymbologistbob had a slice of tart cherry, and his friends each had a blackberry and blueberry. It was the Pie Town Pie Festival after all, so after a bit more wandering they found themselves at the pie stand for the Pie Town Cafe and each shared a mini pecan and strawberry rhubarb pie. It was decided that the strawberry rhubarb was some of the best z-bob ever had. 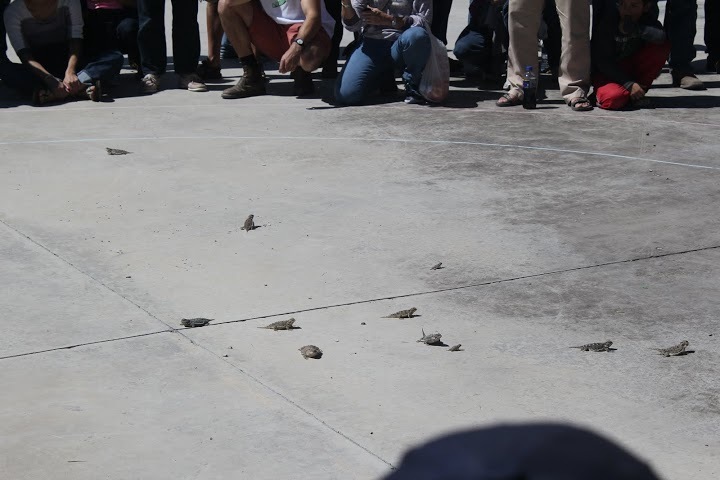 After the contest (and subsequent clean up as there was whipped cream and pie remnants everywhere) it was time to enjoy the horned toad races. As I have never experienced such a race, I had questions. Could you bet on the toads before the race? 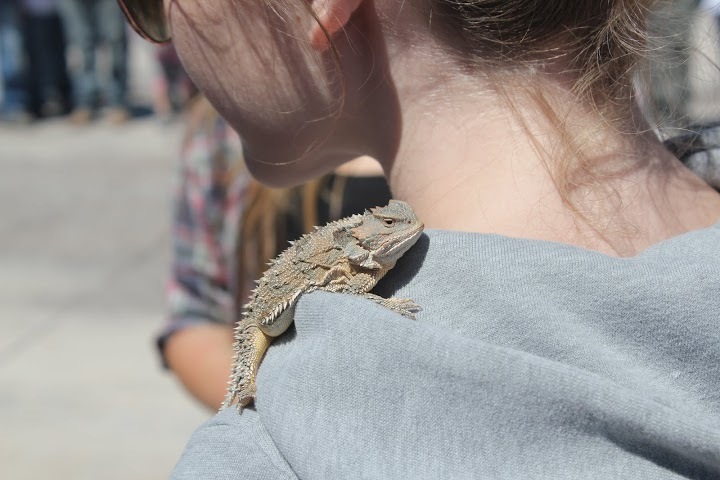 Were there little lizard stalls so you could see which one looked like a winner? Was there illegal drugging of horned toads going on to ensure a victory? Were there grasshopper jockeys? Luckily, these questions were quickly answered. No, no, no, and sadly no. Everyone gathered on the basketball courts around a chalk circle. Each of the horned toads were marked on their stomachs with number and the owners were marked with the same number on their hands. The owners were asked to sit outside the circle to encourage their horned toads to victory. The toads were all placed into a bucket and then dumped out in the middle of the circle. The first toad to cross the chalk line was the victor. Pie Town Horned Toad Race — bucket o toads. Make friends with your toad so you can cheer him/her on to victory! Pie Town Horned Toad Race — what pies and horned toads have to do with one another, I don’t know. But, horny toads! There looked to be an early victor, Taco, who ran to the edge of the circle, but then seemed to get confused and just ran around the edge. He was upset by a wee little horned toad. 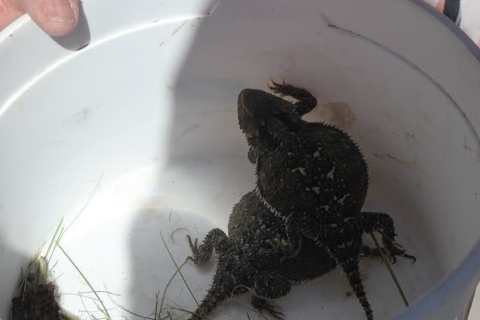 The word “race” might give the impression that this is a fast-paced event, but it took the better part of 15 minutes for a horned toad to finally cross the not-too-distant finish line. After all that excitement, there wasn’t much left to do. The Pie Festival had other activities into the evening, including a dance where the winning pies from the baking contest would be announced. But as I was responsible for a seven-year-old that I had hopped up on sugar, it seemed best to wind up our day at the Pie Festival. We went back to the Pie-o-Neer to purchase pies for the road, but the majority of them were sold out. So we went to the Pie Town Café and purchased several red chile and apple cinnamon mini pies for gifts. I’m told they were delicious (although I was also told they tasted more like Hot Tamale candy than red chile). We then hit the road back to Albuquerque, after a pleasant day filled with pie, horned toads, more pie, and fun. Ever since my seven-year-old nephew, Little Trickster, learned he would be returning to the Pie Festival in Pie Town, New Mexico, he talked about nothing but winning the children’s pie eating contest. Turns out, last year he lost due to a hand raising technicality. A similar travesty was the fate of Sir Leopold Chestnut, SECOND PLACE winner of the 1903 Summer Olympics prune and custard pie eating contest. Both were sadly unaware that after they finished their pie, they were to raise their hand to be declared the winner. At least this year Little Trickster could learn from his folly. Chestnut, shunned by his peers, never competed again. Little Trickster had been studying up on how to win this year’s contest. On the two-and-a-half-hour journey from Albuquerque to Pie Town, between singing verses of popular Disney songs, he spoke non-stop about the rules of the contest as well as the best techniques to take the crown. Each contestant was given an appropriately sized fruit pie by age division. All but the youngest contestants had to keep their hands behind their backs during the challenge and could not use them to eat said pie. The best technique, said Little Trickster, was to move the pie closest to the edge of the table. After the stuffing was inhaled, it was best to use your teeth to flip over the pie tin and drop the pie on the table. It was much easier to eat the rest of the pie this way. He called it the alligator technique. A bit of a misnomer as we all know alligators prefer tarts to pies, unlike their fatter cousin the crocodile. I knew my nephew was entering the pie eating contest, but I had no plans of entering the adult pie eating contest. I envisioned my first time at the festival perusing pie stands and craft tables. 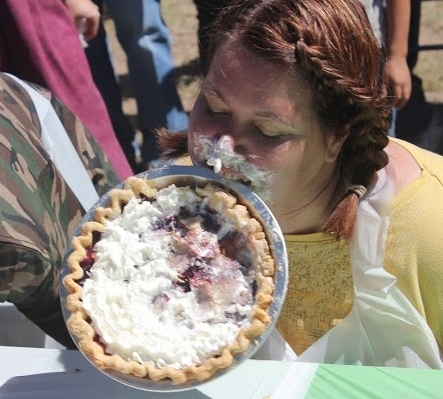 I had not planned on entering a pie eating contest. But Little Trickster, being adorable, was insistent. And I, being both a sucker and partaker in pies, was talked into entering the contest. Upon our arrival to the Pie Festival, I went to the pavilion and paid the $1 fee to sign Little Trickster up for his age group and then paid $5 to sign myself up for the adult division. We were each given ribbons that showed the judges that we were participants. In hindsight, it would have been a great deal to concede the contest and walk away with a $25 pie for $5. 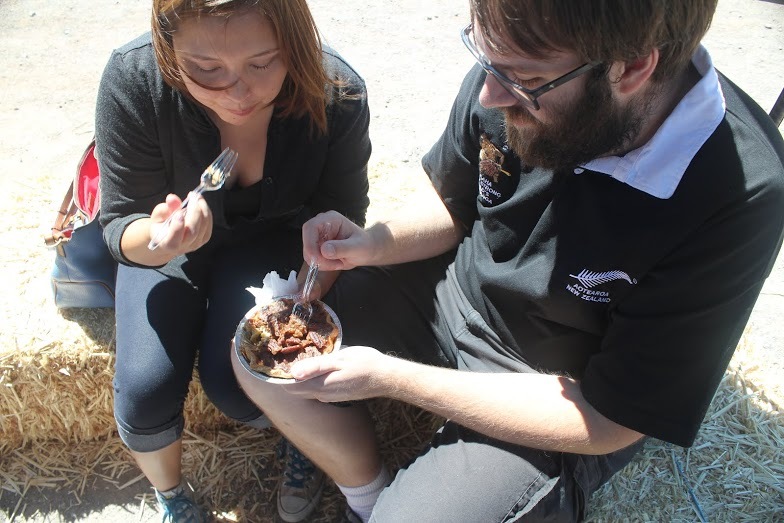 At 1 p.m., the pie eating contestants gathered around the row of tables in the middle of the Pie Festival open area. The audience surrounded the pies and contestants (outside the “Splash Zone”) to cheer on their friends. Much attention was paid to the Splash Zone in fear of pie in the sky debris. Unfortunately, those older kids were way faster. Out of the 19 participants, Little Trickster got 4th place. I was very proud of his placing and he seemed to be in good spirits, which can’t be that surprising as it’s hard to be sad after eating pie. Then it was my turn. Little Trickster came up to me and helped me tie my plastic apron. “Since, I didn’t win, you’re going to have to win this,” he said. “Don’t worry,” said Little Trickster. “I’ll coach you. I already asked the judge if I could stay with you and cheer you on.” There were 24 participants in the adult division, and the trash talking starting early. A man from Portland told the rest of us we were going down. A woman from Arizona giggled and said this was her first time. A woman from California let us know she had won three years ago. Ooh, a seasoned veteran. We lined up around the tables and placed our hands behind our backs. Little Trickster ran around to eye the competition and shout out instructions. He told me to kneel to be closer to the pie. “REMEMBER THE ALLIGATOR!” he shouted. The judges placed the pies in front of us. Unfortunately, these weren’t mini pies, or even medium. These were daunting, huge, full-sized strawberry rhubarb pies. Pies that were covered in whipped cream (much like most of the previous contestants). And not with a shot, but a splat, the contest was on. I shoved my face into that pie and started chewing. And chewing and chewing. And I stopped and realized I was only through the whipped cream. I went back to chewing. I finally hit the filling. It was delicious. I could hear my friends cheering me on. I could hear Little Trickster yelling out instructions. “Do the alligator! Stick your whole face in that pie!” I got through half the pie and drug the tin over to the edge of the table with my teeth. I flipped it and dumped the pie on the table. Trickster demonstrates the Alligator Technique. It still looks pretty tasty. I started working on the crust (which was just as tasty as the pie). I stopped to look up to see where everyone else was at. One girl had given up, and looked rather green. 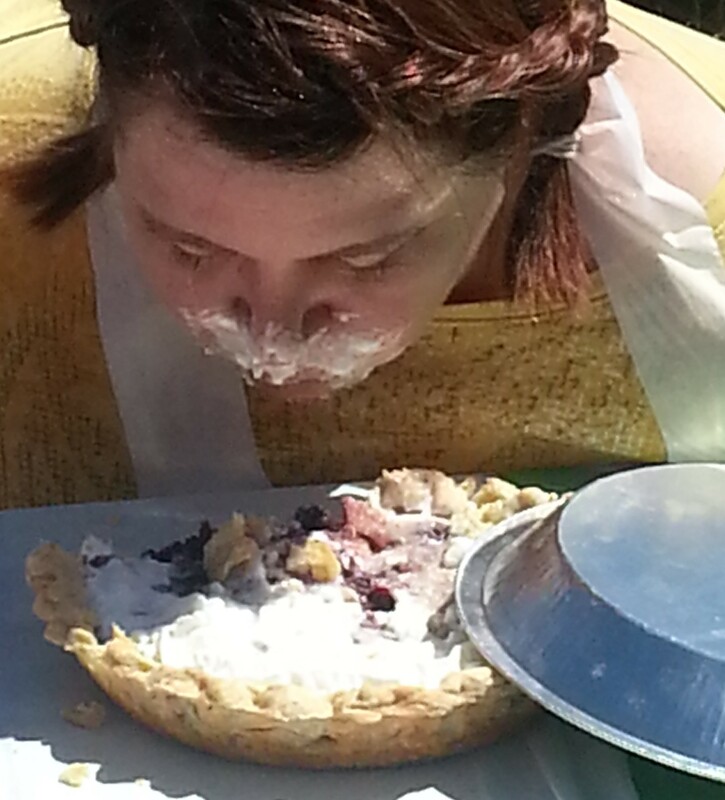 Most of the other contestants had way less pie to get through than I did. “Put your face back in there!” Little Trickster shouted. I took another bite and looked up again. Little Trickster threatened me with bodily harm if I didn’t win. And I couldn’t help it. I spit out my pie laughing. Poor Portland guy. He was across from me and wasn’t too happy. I tried to chew again but the cheers and coaching was just too much. I just kept giggling. Finally a winner was declared, and then the second and third place winners. My adventure was over. Out of the 24 contestants, I came in 23. Thank goodness for the one green-looking girl.